The Micro Plastics sign fastener is designed for rapid assembly and disassembly of a sign or other panel to its support structure. The reusable fastener was designed to fit a hole diameter of 5/16 in. to 3/8 in. (8 mm to 9.5 mm) and can be used to fasten two pieces together with total panel thickness from 1 in. to 1.64 in. (25.4 mm to 41.6 mm). Simply squeeze the keeper together and slide onto the pin, then release the keeper. Molded from impact-resistant and UV-stabilized nylon 6/6, the sign fastener is designed to withstand the elements in outdoor applications. The Protomold Design Cube illustrates important considerations when designing plastic injection molded parts. It showcases a range of available surface finishes and examples of bosses, gussets, and ribs. It also demonstrates the impact on part quality of overly thick or thin sections, as well as ways to incorporate holes and their potential effect on resin flow. Get your no-cost Design Cube today. The first successful free flight of a new rocket-powered vertical landing demonstrator occurred recently at Mojave Air and Space Port, Mojave, CA. The flight used a new flight control system concept that will enable future demonstrations of landing technologies needed for exploration of planets and moons, as well as near-Earth objects, like asteroids. NASA’s Flight Opportunities Program sponsored the flight and control system test. 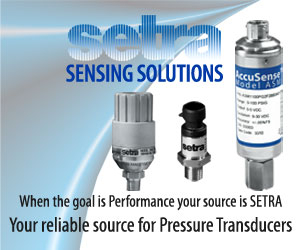 Click the ad above to find out more about Setra's full line of high-performance sensing products. Sandvik, a Swedish engineering group known for its work in tooling, materials technology, mining, and construction, says that the Nobel Prize in Chemistry for 2011 awarded to Prof. Daniel Shechtman last October for the discovery of quasicrystals is intrinsically linked to the groundbreaking work the company has carried out in the field of nanotechnology for more than 20 years. Sandvik is excited to see that Shechtman has finally gotten the recognition he deserves. Is tiny manufacturing your big thing? Check out the Micromanufacturing/MEMS/Nano Live USA 2012 show March 7-8 at the Stephens Center, Rosemont, Chicago. An innovative transmission from Hi-Lex America continues to reliably and quietly open and close automotive lift gates thanks to design and development assistance from Ticona Engineering Polymers, which helped the automotive tier supplier create new injection-molded high-precision plastic shafts and gears. Get the .pdf guide (no registration). First, the bad news: injection molded parts are subject to a host of cosmetic flaws including sink, gate vestiges, ejector pin blemishes, drag marks, texture flaws, knit lines, burns, flash, and inconsistent coloring. The good news is that adherence to basic design rules will eliminate many of these problems. ARKTOS Developments Ltd. – the designer and manufacturer of a remarkable amphibious vehicle known as the ARKTOS Craft – is using simulation software from Autodesk to prepare its products to operate in some of the world’s most environmentally demanding locations. The F-35A flight test team at Edwards AFB, CA, recounts 2011, a productive year of test that they call "the year of the firsts." From flight envelope expansion to mission systems, and KC-10 fuel testing to sensor fusion, the team made great strides testing the F-35A fighter, a conventional takeoff and landing craft that is the smallest, lightest F-35 version and the only one in the series equipped with an internal cannon. 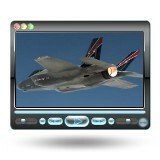 The fighter's fraternal twin, the F-35B, is a short-takeoff and vertical-landing craft. DARPA is developing a semi-autonomous four-legged robot, the Legged Squad Support System (LS3) based on the BigDog system created by Boston Dynamics, to work in tandem with a squad of Marines or Soldiers. Recently, the LS3 prototype underwent its first outdoor exercise, demonstrating the ability to follow a person using its “eyes” – sensors that allow the robot to distinguish between trees, rocks, terrain obstacles, and people. Over the course of the next 18 months, DARPA plans to complete development of and refine key capabilities to ensure LS3 is able to support dismounted squads of warfighters. Features to be tested and validated include the ability to carry 400 lb on a 20-mile trek in 24 hr without being refueled. Also planned is the addition of “hearing” technology, enabling squad members to speak commands to LS3 such as “stop,” “sit,” or “come here.” Hopefully it will be made quieter too.